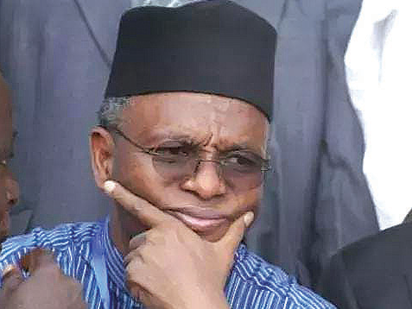 The crisis in the All Progressive Congress in Kaduna state got messier Sunday as the Restoration faction of the party led by Senator Hunkuyi announced the suspension of the state governor, Nasir El Rufai for six months for his failure to respond to a query issued to him last week Thursday. El Rufai’s suspension is coming two days after the main faction of the party announced the suspension of Senator Hunkuyi for six months and expelled 28 others. “This briefing is sequel to 48 hours ultimatum/query and warning issued to the state governor to explain and defence himself against the allegations leveled against him which he failed to respond. The group noted that the Presidential Reconciliation Committee led by National leader of the party, Asiwaju Ahmed Bola Tinubu, may hit the rock if El-Rufai refused to admit his faults. A member of the Restoration faction, Mataimaki Tom-Maiyashi noted the Governor’s body language and action didn’t suggest the willingness to submit to genuine reconciliation. He said other parties may benefit from the crisis in the party if the APC fails to put its house in order. :”The Stakeholders welcome the initiatives to settle major issues which a are dividing and weakening the party. “The real reconciliation will only be achieve if justice and the willingness to take difficult decisions are upheld. “Stakeholders observed that in Kaduna State at least, the postures and actions if the governor, Nasir el-Rufai, and his associates do not suggest the willingness to submit to genuine reconciliation. The post Kaduna APC crisis gets messier, El Rufai suspended for six months appeared first on Vanguard News.